Dr. Rosland focuses on innovations in care for chronic health conditions. Dr. Rosland is the Principal Investigator for a VA HSR&D funded 4 year study to determine how the CO-IMPACT intervention improves patient engagement and lowers risk for diabetes complications, through technology-enhanced coaching of patients along with supportive family members. She is also the Principal Investigator of an NIH NIDDK funded 5 year study examining the impacts of the Family Action for Health (FAM-ACT) program, in partnership with the REACH Detroit Collaborative. In FAM-ACT, Community Health Workers train family members of adults with diabetes in effective support techniques, with the goal of making successful diabetes management easier for patients to achieve and to sustain. Dr. Rosland also studies health system efforts to improve primary care delivery. As part of the national VA patient centered medical home (PCMH) initiative, Dr. Rosland leads a national workgroup investigating the impact of PCMH on care for high-risk patients, and is developing a new 'smart' tool that uses health system data to facilitate effective PCMH care management for complex patients. 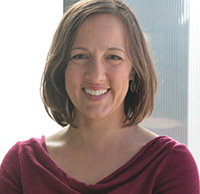 Dr. Rosland's work draws on her expertise in health intervention design and evaluation, health behavior change, social and family support, primary care organization, and Participatory Research.